Of course I had no idea that any of this had a purpose, why would it. It was just an unfortunate accident. An accident I worked hard to pretend didn't exist throughout my middle school and high school years. But ... when it came to adoption, special needs adoption, and we saw our son, we knew that something involving hearing loss was in our future. After Joshua's initial exploratory surgery we learned that a mass was growing inside his ear. The mass needed to be remove in order to avoid permanent injury and/or damage to his inner ear. Additionally, Joshua had a superfluous incompletely formed ear canal. This canal leaked fluid and was a high risk for infection but was connected to nothing else in his head. The specialist we met with let us know that the facial nerve was loose and any surgery would be risky. But allowing the mass to grow would bring continual risk as well. Our surgeon decided we needed a surgery and he would do what he could to help as much as possible. The surgery ... a tympanomastoidectomy. And here's where the part that makes me smile ... a plan only our God could orchestrate. The instructions for Joshua's recovery were on a sheet for all patients recovering from tympanoplasty AND tympanomastoidectomy. His surgery was far more invasive than mine - and I higher degree of difficult (nerve damage, etc) but as I sit here with my busy son, watching him recover today - I smile. I serve an amazing God who used an experience I had some 25 years ago to give me a unique perspective and degree of empathy for my son. The difference, though ... The surgery that took away my hearing has the potential to give my son some hearing back. It will be a while before we know for sure just how effective the procedure was, but the surgeon was hopeful. I'd go with giddy even. He took extra time and said he as extra thorough. He believed all of the extra ear canal was completely removed so the fluid Joshua used to leak from his ear area will no longer be a problem (AMAZING!). The surgeon also said he was able to clear out the entire mass from within the ear canal (AMAZING). He succeeded in creating a wider opening to the canal as well making it likely that future debris will drain as a typical ear should. (AMAZING) But here was the best news parents could hope to hear. The doctor saw (on the blocked side) a fully intact, uninfected, completely functional ear drum. This means that our precious boy, born with bilateral microtia for whom we were prepared to potentially learn sign language, may have the chance to hear with both ears!!!!! (NOTHING SHORT OF MIRACULOUS). As Joshua's ears heal, we will watch for signs and sounds of increased hearing. We will get tested in the coming months, and we will see if the procedure has helped. At this point, I am noticing some similar improvements to his ability to hear (even with his ear packed with cotton). The improvements are similar to what happens when he's wearing his BAHA except ... right now ... he's not wearing it! We don't know how it will all turn out, but yesterday, in so many ways, was just another glimpse of God's keeps demonstrating his hand in our faith journey with our little bundle of strength and courage. Post op - after he let us know quite clearly that head wraps and protective bandages were not part of his plan, nor was his IV. Enjoying his post-op Chick-Fil-A. He requested "BIG fries." The surgery went quite a bit longer than expected so we were hustling back to meet the kids. He was pretty sleepy yet. 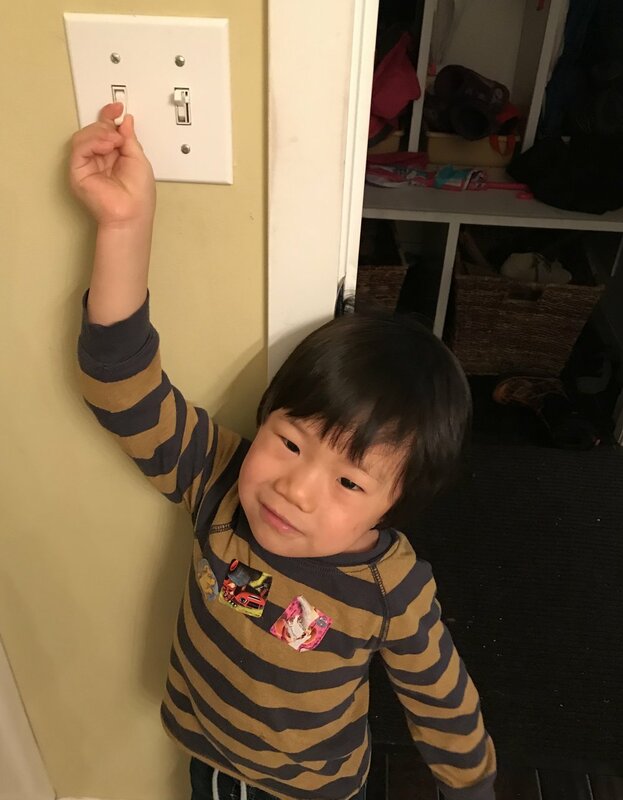 Joshua discovering that this switch actually did something. He had never heard the ceiling fan before and rejoiced in hearing it time and time and time again today!